Meet Alli Nix. Alli is a design intern this summer at 5j Design. She is one of two interns that will be joining our team for these next few months. We are so excited to have her on board and we wanted her to introduce herself to you all. Hello! 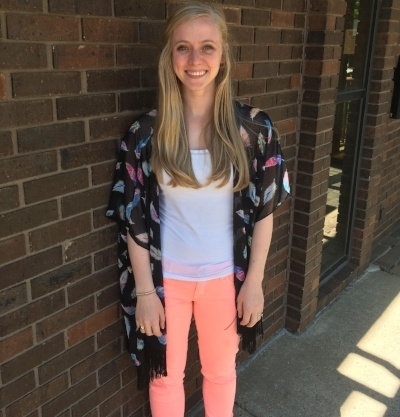 I am Alli Nix, the new summer intern at 5j Design! Recently, I graduated from South Dakota State University with a B.S. in Graphic Design and a minor in Studio Art. I am originally from Watertown, South Dakota and now live in Sioux Falls. I have been happily married for 2 years to my husband, Paul. The two of us met while we were on exchange in Hawaii for school. Paul is just starting his residency as a youth pastor at our church, The Ransom, here in Sioux Falls. Throughout my college career, I lived in 5 different cities spanning 4 states within 2 years and transferred 5 times throughout 6 years. I lived in Colorado, South Dakota, Hawaii, and Minnesota and I loved every minute of living in all these different areas. It was so much fun to explore new areas and get to know different people and their way of living. In my free time I really enjoy painting, illustrating, decorating, binge watching Netflix, baking, spending time with family, hiking and camping. Last summer my husband and I camped at Glacier National Park and we both fell in love with it. From that trip we decided that we want to visit all the National Parks; so next up on our list is Yellowstone National Park! I have a huge sweet tooth and love almost anything with sugar in it. I am also slightly obsessed with dogs and every time I see one I tell my husband that we need one! I am so excited to be able to be a part of 5j Design this summer and I am really looking forward to learning more alongside such a great team!